The best practices of the best practices. One of the most important challenges physical therapy practice owners face is the decision about where to put their time and energy. Which decisions we make every day are the most important? What strategies are most likely to lead to excellent financial performance? Where should practice owners focus their attention? Said differently, what best practices should be adopted? A best practice is the process of finding and using ideas and strategies from outside your company and industry to improve performance in any given area. Big business has used best practice benchmarking over decades and realized billions in savings and revenues in all areas of business operations and sales. Small business can reap even greater rewards from best practices. But what are the best practices in private practice physical therapy? Rather than utilizing trial and error, finding the industry leaders and looking at their behavior and practices can provide information on what strategies are most effective. In early 2014, I led a research team to design and collect surveys from practice owners in an attempt to determine what differentiated practices that are highly profitable from those that are merely profitable. Each survey consisted of 86 questions. Surveys were sent to members of the Private Practice Section of the American Physical Therapy Association (APTA), participants in the Annual Physical Therapy Benchmark study by Chuck Felder, and the graduates and students of Evidence in Motion’s Executive Program in Private Practice Management (EPPM). In order to participate, each practice had to be 51 percent or more owned by a physical therapist. Two hundred and eighty-nine private practices responded, representing 1,156 facilities. The practices were separated into two groups based on their reported 2013 Annual Performance. The “low-profit” group had a profit margin less than 8.9 percent. The “high-profit” group had profit margins more than 16 percent. The vast majority of the respondents had 10 or less clinic locations, with the overall average being 4 locations per practice. However, the high-profit group had a significantly larger number of locations than the low-profit group: 20 percent more on average. The high-profit group also had more total physical therapists working. Twenty-five percent of the respondents in the high-profit group had more than 21 total physical therapists working at their locations. In the low-profit group only 8 percent had reached the same size. The high-profit group reported multiple systems in place that differentiated them from the low-profit group. The high-profit group was more likely to answer that they had a performance development system in place and that this system was more likely to include a system for employee rewards and incentives. They also held more off-site training and development retreats and on average spent $800 more per year on continuing education. In addition to spending more on continuing education for therapists, the high-profit group also provided more sales training for marketing representatives. They made marketing efforts continuous and reported spreading events evenly throughout the year in contrast to concentrating on a few big events each year. The high-profit group reported tracking referrals more closely than the low-profit group. The high-profit group did not necessarily use more software or technology to manage patient care. However, they did use more software and technology to manage their business. Software can help by making key performance indicators accessible in real time to allow for better decision making. In not only attitude, but in action, the high-profit group focused on working “on their business.” There was a significant correlation with technology, marketing, and employee systems and higher profitability. 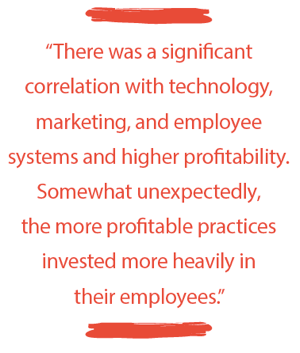 Somewhat unexpectedly, the more profitable practices invested more heavily in their employees. This was not limited to professional staff, but also included going on more developmental retreats and spending more on training for marketing representatives. They did not necessarily pay higher salaries, but did invest more in development. Benchmarking studies such as this one do not allow us to draw direct cause and effect conclusions. However, the results of these data do clearly point to a correlation between management activities and stronger financial performance. Developing management competencies that lead to growth, strong employee systems, tightly managed marketing systems, and the use of technology to track key performance indicators may lead to higher profitability. Best practices are effective when we can identify the best way of doing something, and from that moment on, we no longer have to ever think about the best way to handle things—because we already have. 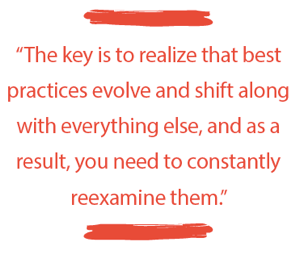 The key is to realize that best practices evolve and shift along with everything else, and as a result, you need to constantly reexamine them. At least for the time being, we have some good guideposts to follow. Dr. Laurence N. Benz, PT, DPT, OCS, MAPP, is chief executive officer, leadership coach, and partner of Confluent Health that includes multistate private practice physical therapy clinics, Evidence in Motion and Fit for Work. He can be reached at larry@physicaltherapist.com. Dr. David Browder, PT, DPT, OCS, is the regional director at Austin/Round Rock/Georgetown, Texas, Texas Physical Therapy Specialists. He can be reached at david@texpts.com. 1. Rumelt, Richard. Good Strategy Bad Strategy: The Difference and Why It Matters. Crown Business. New York, NY. 2011. 2. Gerber, Michael. The E-Myth Revisited: Why Most Small Businesses Don’t Work and What to Do About It. Harper Collins. New York, NY. 1995. Lapide Larry. Benchmarking Best Practices. The Journal of Business Forecasting. Vol. 24, No. 4. 2005. Stauffer, David. Is Your Benchmarking Doing the Right Work? Harvard Management Update, Vol.8, No. 8. Sept 2003. Tucker FG, Zivan SM, Camp R. How to Measure Yourself Against the Best. Harvard Business Review. Jan 1987.